An extension tube increases image magnification of an SM1 lens system on a C-Mount camera. See the Application tab for more information. The simplified drawing above shows how the introduction of an extension tube between a camera and a lens decreases the object distance and increases the image distance. Five Extension Lengths Available Between 0.33" and 3.03"
The external threading of these extension tubes allows for direct connection to C-Mount cameras, while the internal thread is Thorlabs' standard SM1 threading for mounting Ø1" optics or connecting optomechanical components. Each tube can be used to increase magnification and decrease minimum focus distance of a user-built optical assembly in an SM1 lens tube. These can also be used to house fixed-focus systems that can mount directly to C-Mount and CS-Mount cameras, such as our scientific CCD cameras. 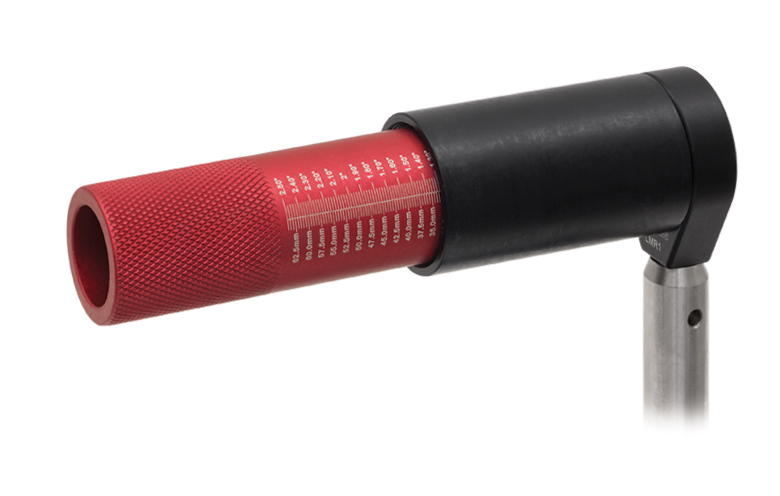 These tubes are available in five extension lengths: 0.33", 0.53", 1.03", 2.03", and 3.03". 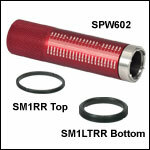 To order other lengths of these extension tubes, contact Tech Support. An extension tube increases magnification of an attached SM1 lens system by increasing the distance between the image and the sensor, as shown in the diagram to the right. This increase in image distance also decreases the object distance, reducing the minimum focus distance of the lens system. 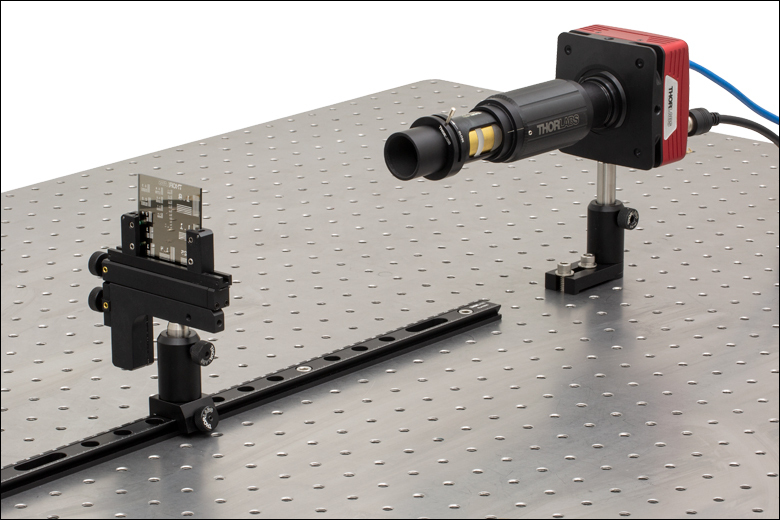 The internal SM1 threading is also designed to mount Ø1" optical elements. Elements can be locked in place with retaining rings and separated with plastic or brass spacers. To easily differentiate the two thread standards of these extension tubes, there are two grooves along the circumference of the tube near the side with the external C-Mount threading. The item # of each tube is engraved on its end face. Our large selection of stock optical elements and optomechanical components can be used to build an imaging solution from the ground up. To see a lens assembly built with Thorlabs components and how extension tubes can be used to enhance magnification, see the Application tab. 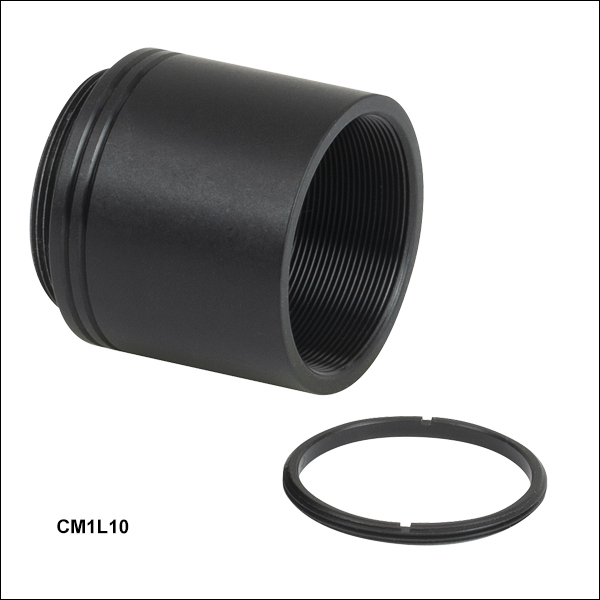 We also offer lens tubes with internal and external C-Mount threading for connecting two C-Mount components, as well as a variety of lens tubes with internal and external SM1 threading. UPH2 1 Ø1/2" Universal Post Holder, Spring Loaded Locking Thumbscrew, L = 2"
Figure 1: A Cooke Triplet Lens Installed on a CCD Camera with an Extension Tube to Increase Magnification. Thorlabs manufactures a wide variety of photonics equipment, providing a platform to create custom assemblies from scratch. We designed a simple four-element lens to demonstrate how using an extension tube increased the system's magnification. We designed a simple 100 mm focal length lens assembly in Zemax; the .zar file for the assembly be downloaded by clicking here. The design was constrained to use only Ø1", stock Thorlabs spherical lenses and separate them with only brass spacers. The assembly is a variation on a Cooke Triplet housed in a 2" long lens tube. To enable manual focusing, the tube was inserted into an SM1NR1 non-rotating zoom housing. The 8051C-USB scientific CCD camera has C-Mount threading, like many industry cameras. In order to adapt our lens to the camera, we used an SM1A9 thread adapter, which allowed our lens to focus to infinity when fully retracted. An SM1D25 iris was added at the front of the lens with an SM1T2 coupler to allow adjustment of light incident on our sensor. An empty SM1L10 1" long lens tube was added at the front to act as a lens hood, which prevented lens flair and bloom by limiting light from outside the lens's field of view. The complete setup can be seen in Figure 1 with the extension tube added. We used an R2L2S1N negative NBS 1963A resolution target as our subject. The lens was stopped down to f/16. Without an extension tube, the minimum focus distance was found to be approximately 300 mm from the lens hood (Figure 2). At this magnification, the lens can conservatively resolve down to 4 lp/mm; at higher line pair densities, the chromatic aberrations cause the lines to blur into each other (Figure 3). By removing our SM1A9 thread adapter and adding a CM1L10 1" extension tube between our SM1 zoom housing and our C-Mount camera, we were able to reduce the minimum focus distance to approximately 200 mm (Figure 4). The resulting magnification allowed us to resolve up to 11 lp/mm before chromatic aberrations blurred the line pairs (Figure 5). This design is limited, but it serves to illustrate how extension tubes like this can be used to increase image magnification and decrease minimum focus distance. This is useful in multiple applications where a lens system needs to operate close to a subject, e.g. quality control inspection equipment for small components or macrophotography. The extension tubes on this page make it easy to quickly build assemblies of Ø1" optics and attach them to a C-Mount camera. Figure 2: Without an extension tube, the minimum focus distance for the system is approximately 300 mm and the system can be focused to infinity. Figure 4: With an extension tube added, the minimum focus distance is reduced to approximately 200 mm; this increases the magnification, but the system can no longer focus to infinity. These extension tubes introduce a fixed spacing between an SM1-threaded system and a C-Mount threaded component, like a CCD camera. This length is listed in the table below as L2. 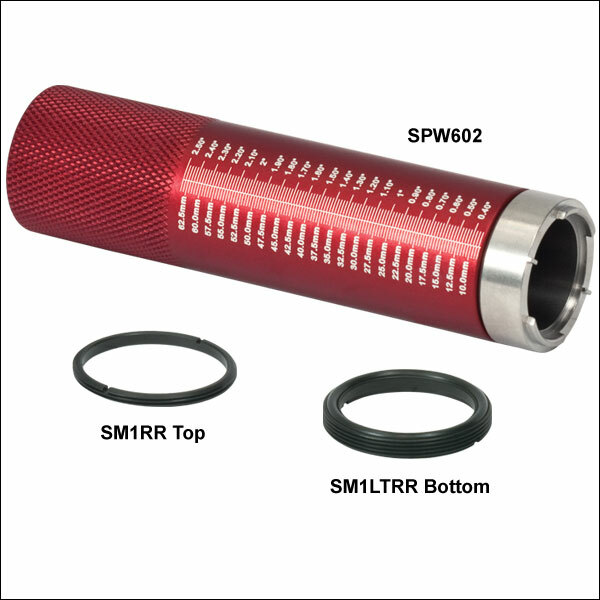 The internal diameter of 1.035" allows Ø1" optics to be mounted; one SM1RR retaining ring is included with each extension tube, and additional retaining rings can be purchased below. 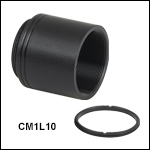 The C-Mount thread depth is 0.16" for all extension tubes. These extension tubes cannot be stacked with each other, but they can be lengthened by adding SM1 stackable lens tubes. For custom extension tube lengths, contact Tech Support.